Andrea and Matt got married in the middle of July, with a church service at St James The Great church in Long Marston, with their wedding reception hosted at the Moat House in Dorsington. Andrea and her bridal party got ready in the morning at the White Swan Hotel in Stratford Upon Avon. Renting a space for your bridal preparation is always a good move if you ask me - Being away from home means you can relax a little and make it feel even more like a special day. Further more, there's usually someone on hand to help out in the morning of your wedding which is also a welcome addition. The above photo is a little different to the tradition image of the father of the bride seeing his daughter on her wedding day for the first time. 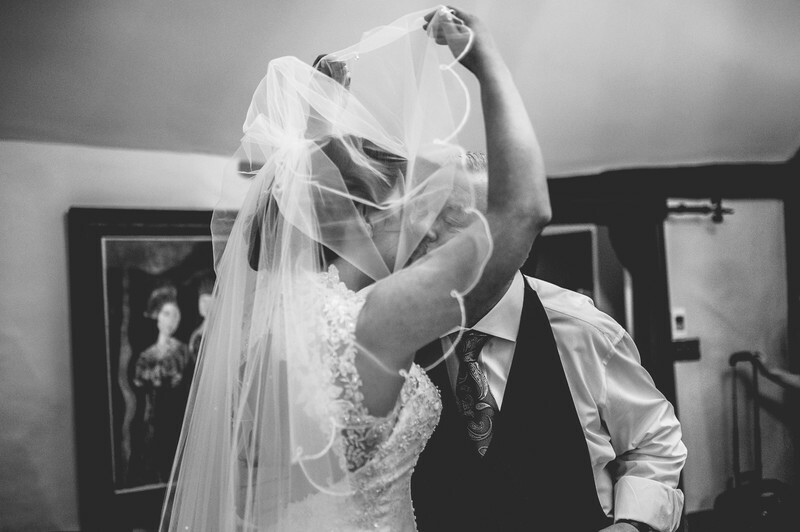 I love how Andrea has raised her veil to kiss her father, and how it frames them both in this wedding photo. I feel like making this image black and white removes and distractions from the image and allows you to focus in on the important parts - the emotion of the day. Images like this are why I enjoy documentary or lifestyle wedding photography so much - you simply can't get genuine images like this if you pose people. Location: White Swan Hotel, Stratford Upon Avon.